Wyoming is a unique place, with spectacular outdoor opportunities. Our graduate students have the opportunity to experience the cultural and environmental amenities of our region, as well as obtain an advanced degree. We believe our Graduate Students are an important asset to our department. Since we are a master’s only program, our focus is on teaching applied skills that students can use for entering the workforce or for more advanced studies. In both of these scenarios, teamwork is essential. This means that learning from and working with peers and professors in a variety of settings is a critical part of graduate student training. 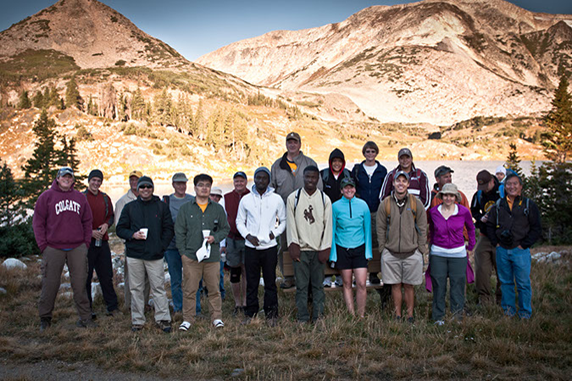 To help foster cohesiveness within our program, and have a little fun, we start every academic year with a climb of the highest peak in the Snowy Range: Medicine Bow Peak (12,000ft/3,871m). Graduate students who are able are encouraged to attend. It is a great opportunity to meet peers and professors in a non-academic setting – an introduction with a panoramic view. The climb is not as grueling as it sounds. It starts at 10,800ft (3,480m), but only covers four miles (6.4km) round-trip. Each year we have people who come from sea level successfully complete the hike. In the afternoon after the hike, we have a welcome barbeque. Good food and camaraderie flow freely. Click the links on the left to view past hikes.